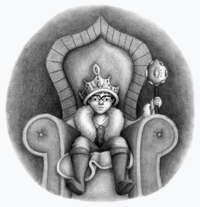 May 23, 2011 (Durham, NC) — After the last Harry Potter film is released this summer, what will young fans of fantasy-adventure fiction have to look forward to? Split Rail Books in Durham, NC, suggests its new title, “The Mahogany Door,” the first novel in a new fiction-fantasy-adventure series written by J. Mark Boliek of Durham especially for young readers. And it comes with an original-music soundtrack CD. 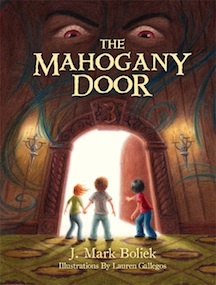 “The Mahogany Door,” book one of Boliek’s The Bruinduer Narrative series, is told by an unnamed grandfather who captivates a group of children with his fascinating story, first out on a beach then huddled around the fireplace of a beautiful mansion by the shore as a fierce thunderstorm rages outside. The story centers around three friends, separated years ago by a traumatic event, who are compelled to reunite so that they may once again pass through “The Mahogany Door” and into the fantasy Vryheids world of Bruinduer. They must fulfill a destiny they left undone nine years before to keep Bruinduer from collapsing. One of the friends lost his parents and his memory in a horrible accident and has no idea what to expect. One knows too well and has tried to forget. The third friend’s insistence that they must return to Bruinduer is mysterious and suspicious. The friends’ journey back to the world behind “The Mahogany Door” leads to the book’s “teaching moments,” which resonate with the author’s own life – about things in life not always being what they seem, about the value of friendship and the importance of completing tasks, and about the secret to tapping into the power of a their only “guide” along the journey, a monstrous being they call “Billy.” And the end is designed to leave young readers anxious for book two. Author J. Mark Boliek is a former football player and military man, a computer programmer and musician, and the son veteran broadcast journalist Dave Boliek of WTVD-TV. He began working on The Bruinduer Narrative nine years ago. His initial 157-page draft turned into three distinct stories in which the first tale, “The Mahogany Door,” evolved into a 353-page children’s fantasy novel. He is currently working on the other two books in what he expects to be a trilogy. The soundtrack CD accompanies the book. For more information about “The Mahogany Door” by J. Mark Boliek, published by Split Rail Books, go to www.jmarkboliek.com. Each track from the accompanying CD can be heard at www.jmarkboliek.com/the-music) and the book with CD can be ordered directly at www.jmarkboliek.com/cart. Author: J. Mark Boliek. Publisher: Split Rail Books. Publication Date: May 2011. Genres: Fantasy-Fiction, Adventure-Fiction. Illustrator: Lauren Gallegos. Age Group: 10 and up. ISBN: 978-0-9832900-0-1. Paperback: 353pp. Retail Price: $24.95. Currently available: www.jmarkboliek.com. J. Mark Boliek, the author of “The Mahogany Door” and the entire Bruinduer Narrative series, grew up in Eden and Durham, North Carolina. An avid writer and athlete, he received a football scholarship after high school but chose to join the Navy instead. He graduated from Concord University in Athens, WV, in 1997 and lived in Wilmington, NC, for a while, where he began to develop The Bruinduer Narrative, a fantasy-adventure series for young readers, as well as the soundtrack CD that accompanies “The Mahogany Door.” Mark and his wife Jill now live in Durham, NC, where they own and operate Split Rail Books and Split Rail Multimedia LLC. For more information on the author and “The Mahogany Door,” visit www.jmarkbolief.com and his Facebook page.